The latest OSCE mission report on the Ukrainian conflict has recorded a spike in violence, with monitors largely blaming Kiev. However, RT’s correspondent says the shooting pales in comparison to what locals went through before the Minsk deal. 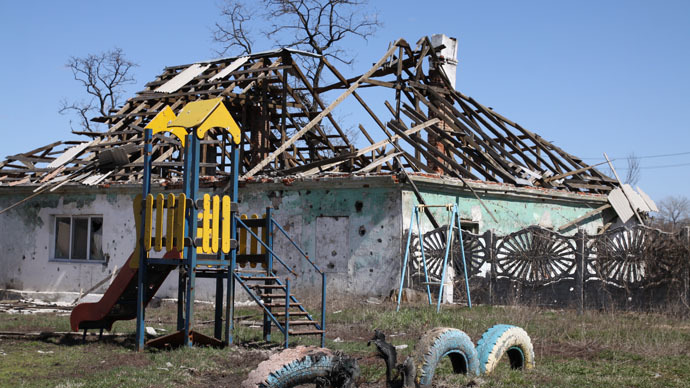 Military action between the Ukrainian troops and the self-defense fighters has renewed in the vicinity of Shirokino, following intense strikes from Kiev’s military, the daily report by Organization for Security and Co-operation in Europe (OSCE) stated on Tuesday. Over the following two days, intensive fighting with heavy weaponry went on near the front line, with the monitoring mission recording many explosions and much gunfire. City-wide gunfire in #Donetsk aimed at #ukrainian drone. Saw tracer rounds streaking up from many neighborhoods. Drone reportedly down. “All of this was destroyed on the 12th of April… why do they keep shooting. I’m scared… I’m scared….” a Donetsk woman told RT, speaking about the surrounding buildings. Earlier on Wednesday, the Russian OSCE representative Andrey Kelin said military action was started by Kiev’s forces. “In Shirokino, it all started with the shelling by the Ukrainian troops, after that there was gunfire. Near Donetsk airport, everything began with the attempt [by Kiev] to seize the town of Spartak,” Kelin said. The OSCE report stated most of the weaponry relocated earlier by Kiev is still in the storage places they are monitoring. “However, three previously recorded towed artillery guns were not present at one of the locations,” the report pointed out. However, all heavy weaponry remains in the security zone indicated by the Minsk accords. “Tanks and mortar launchers are to be pulled 15 kilometers back by each side. This will provide a 30-kilometer wide security zone. The distance will ensure the combatants cannot hit each other,” Russia’s representative at the ceasefire control center, Aleksandr Lentsov, told RIA Novosti on Wednesday. The UN estimates over 5,600 people have died in the conflict in eastern Ukraine, which has lasted for over a year. A ceasefire brokered by the leaders of France, Germany, Russia and Ukraine in February, dubbed the Minsk-2 agreement, stipulates heavy weapons should be pulled back from the frontline and that a security zone should separate the warring sides.